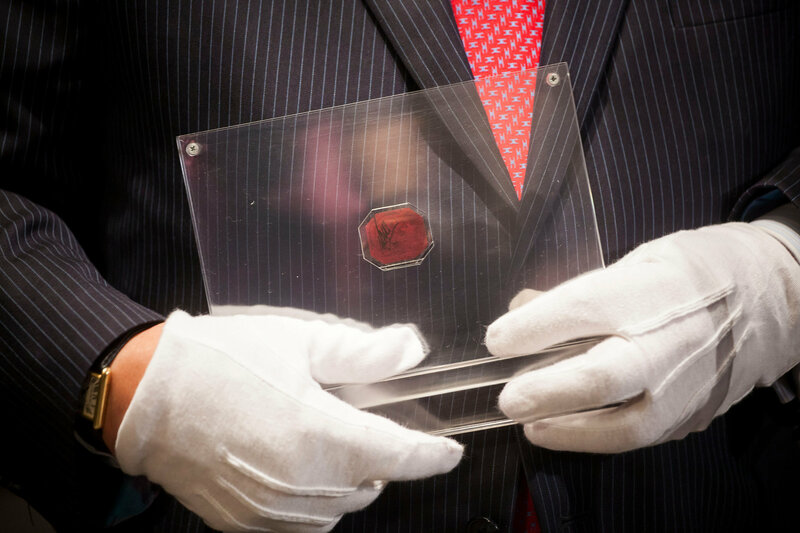 The rarest stamp in the world, the only known surviving example of the 1856 British Guiana One-Cent Magenta, sold for a record $9,480,000 (including buyer’s premium) at a Sotheby’s auction in Manhattan on Tuesday. The pre-sale estimate was $10 – $20 million, so they were expecting the new bar to be set significantly higher, but still leaves the previous record-holder — the Swedish Treskilling Yellow sold in 2010 for an undisclosed amount that was at least as much as the $2.3 million record it set in 1996 — in the dust. At one-thousandth of an ounce and 1 5/32 x 1 1/32 inches, the stamp is now the most valuable object in the world by weight, volume and size. This rather plain stamp printed in black ink on magenta paper was an emergency issue by the postmaster of British Guiana when an expected shipment of English postage failed to arrive on time. The printers of the Royal Gazette newspaper in Georgetown ran a small contingency supply of stamps: one-cent magentas, four-cent magentas and four-cent blues. They were printed with a simple outline design of a three-masted ship and the colony’s Latin motto “Damus Petimus Que Vicissim” (We give and expect in return). About 200 of the four-cent stamps have survived, but the only one-cent known to exist was rescued by a 12-year-old boy who found it among his uncle’s papers in 1873. He collected stamps, so when he saw this one that he didn’t have in his collection, he cut it off the envelope and put it in his album. Because it wasn’t a pristine copy (the original issue was square; this one has cut corners), young L. Vernon Vaughan sold it another collector, Neil McKinnon, to buy some newer, prettier issues. 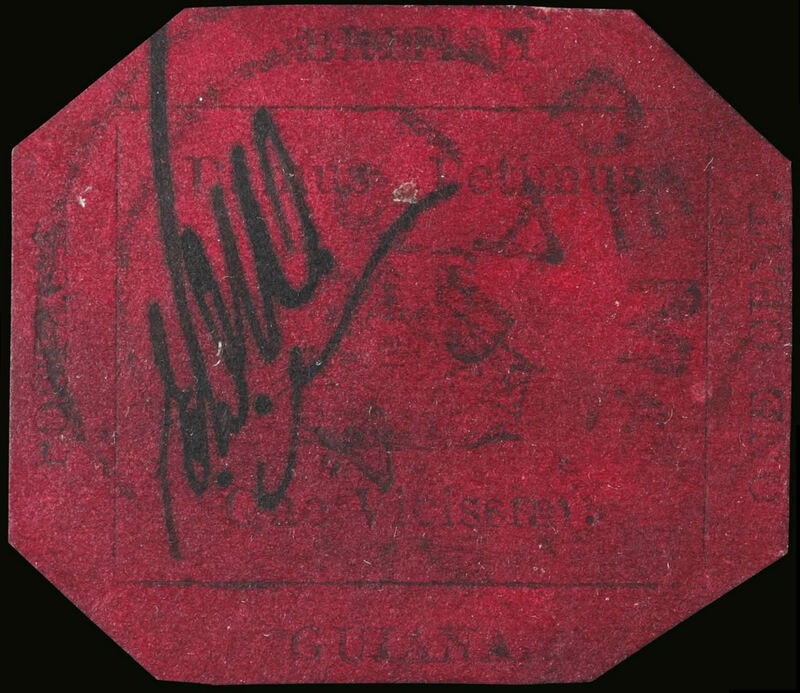 The One-Cent Magenta left British Guiana in 1878 when McKinnon sent it to Scotland for appraisal. 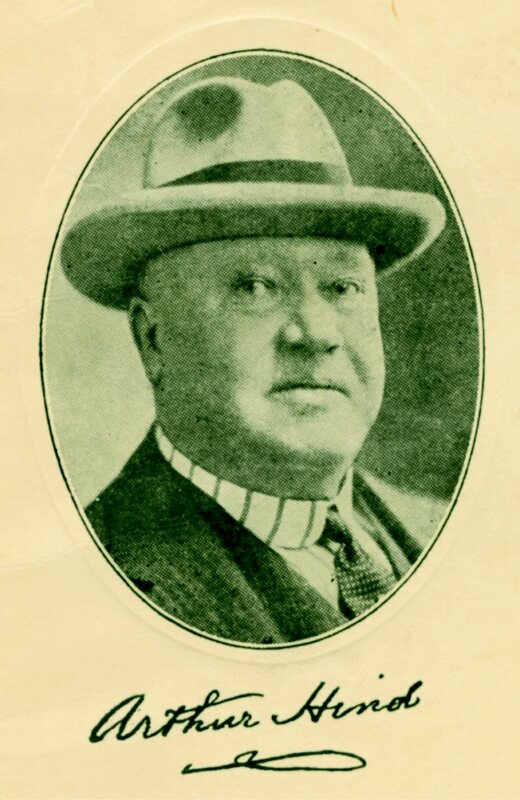 The stamp passed through several hands after that, including those of Count Philippe la Renotière von Ferrary of Paris, a legendary philatelist, and textile magnate Arthur Hind of Utica, N.Y. Hind bought it in 1922 at auction for $35,250, a record at that time, and reportedly outbid avid stamp collector King George V for the little red stamp. “Arthur Hind had never intended to even bid on the British Guiana,” the Sotheby’s catalog said. Hind was also rumored to have secured a second One-Cent Magenta only to light his cigar and the stamp with the same match, ostensibly to ensure the value and rarity of the one survivor would remain untarnished. The source for this story was an anonymous letter writer, so who knows if it’s true. The last time the stamp was sold was 1980. The buyer was du Pont chemical fortune heir John E. du Pont who spent a then-record $935,000 for it. In 1997, du Pont was convicted of murdering Olympic gold medalist wrestler Dave Schultz and was sentenced to a term of 13 to 30 years in prison. He died in prison in 2010. It’s his estate that sold the stamp. For more details on the incredible journey of this wee stamp and the history of British Guiana, see the Sotheby’s catalogue multi-part exploration. This entry was posted on Wednesday, June 18th, 2014 at 10:00 PM	and is filed under Modern(ish). You can follow any responses to this entry through the RSS 2.0 feed. You can skip to the end and leave a response. Pinging is currently not allowed.